Today, I walked by an Apple store and was shocked to see a makeshift memorial. 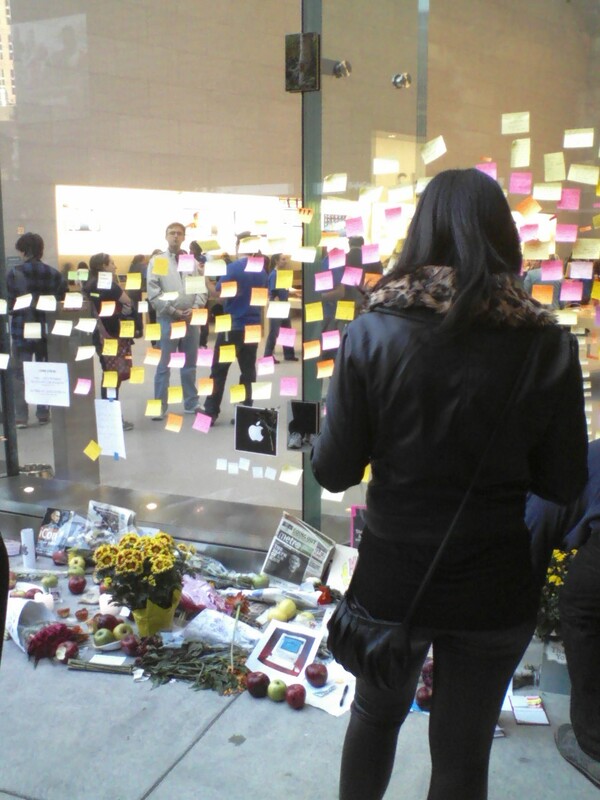 There was a wall being created outside against the glass facade with flowers, cards, candles, pictures, clever manipulations of old Apple ads and dozens of post-it notes that people were handwriting while they stood and paid their last respects to Steve Jobs; like he was a close personal family member! He was the CEO of a company, a corporate executive, not a pop-star, a princess or a movie star – I was amazed. I knew Job’s was a great showman and presenter but it’s one thing to admire a CEO or captain of industry and quite another for makeshift memorials to start popping up outside Apple retail stores all over the world on news of his death. I saw people standing silently, some looked like they were praying and most were writing a personal note and sticking it on the glass that made up the front of the store. It was not teenagers who were flocking but people in their late fifties and sixties who made up the majority coming to pay and post their last respects to the “genius who changed their life forever.” I am not sure if this happened when George Eastman or Henry Ford died but I cannot imagine any other corporate executive, no matter the extent of his genius, being lauded in this way. In the end it is a testament not only to the brand that Jobs built but the products he delivered in creating this unbelievable emotional bond with customers. Apple is made up of his DNA and is a part of him. No compromise. Pure design cannot carry the day alone, great advertising and marketing only get you so far, and pure showmanship runs thin if the products don’t deliver – in the end Apple products have delivered time and again, and in the odd instance when one does not, Apple replaces it or fixes it for free; no questions asked. Therein lies the secret of turning a loyal customer into an evangelist for life. The other day I walked into our bank to add me as a signer to our business account. I made sure to call in advance and ask their small business representative what I would need to do this. They told me I would need to have one authorized signer present, and two pieces of identification. I asked twice to make sure and both times they re-assured me and said this was all I needed. He looked at me and said, “There seem to be two other signers on this account?” We affirmed that the business had two other owners. He proceeded to ask if we had any paperwork to show that I was indeed one of the new owners. I said I did not. He then asked if we could have the other two signers present to authorize this. One is in Seattle and the other in California; so naturally we said that this would not be possible now or in the near future. He started to mumble and begin stating the bank’s policy clearly being dictated by his computer screen; and I started to see red. I turned to my business partner and said loudly that this was my greatest frustration with this bank – that every person I spoke to seemed to give me a different answer; and this was not the first time. First, I thought he was joking. Realizing he was not I politely explained that the name, title and employee number of the person I spoke with was irrelevant because no matter whom I speak to, the bank’s policy should remain consistent. Rather than cutting his losses and apologizing he proceeded to dig himself further down the customer-service rat hole by saying that I must have spoken to the wrong department (still the bank’s mistake for misdirecting my call or for answering a question they were not equipped to).When I informed him that I had actually spoken with a small business representative, once again rather than apologizing he proceeded with even greater enthusiasm down the same rat hole. Rather triumphantly, he explained that the issue was one of miscommunication; that the problem seemed to clearly lie in how I must have asked the question…!!! I know this bank wants its brand to be valued and to command the same loyalty, from customers, that Apple and American Express do. I also now know why they do not.